Republic of Ireland assistant manager Roy Keane and midfielder Harry Arter. HARRY ARTER IS happy to be back in the Republic of Ireland squad after having clear-the-air talks with assistant manager Roy Keane. That’s according to Ireland boss Martin O’Neill, who has included Arter in his provisional panel for the Uefa Nations League fixtures against Denmark and Wales. After being involved in a verbal spat with Keane when the Ireland squad assembled at the end of last season, Arter asked to be left out for September’s games in Wales and Poland. However, O’Neill said this morning that his assistant and the on-loan Cardiff City midfielder have now patched up their differences. “Roy and he have had a conversation. Harry is pretty happy. He wants to be in the squad and he wants to play. Harry was pretty happy with the outcome and he’s back in the squad. I’m delighted because we don’t have that many players playing in the Premier League. 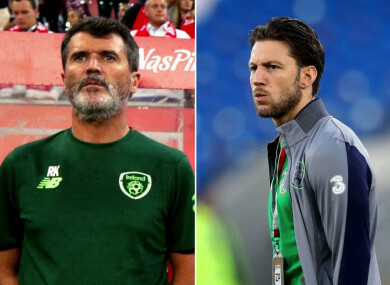 The controversy surrounding the fall-out between Keane and Arter was exacerbated when an audio message recorded by Ireland defender Stephen Ward was circulated on WhatsApp. In it, he revealed that Arter had been subjected to an expletive-laden tirade from Keane, who lashed out at the player over his injury record. In spite of the leaked message from Ward — who hasn’t been included in the latest squad due to injury — O’Neill won’t be implementing any in-house changes. He also reiterated that Keane’s abrasive approach wasn’t a factor in Declan Rice’s decision to consider his international future amid interest from England, his country of birth. “In this day and age things will get out all the time, whether it takes a day, a week or — in this case — about two months. Things will get out. These things happen,” O’Neill said. When asked if players should be able ensure that differences with management don’t prevent them from getting on with their careers, O’Neill said: “Absolutely. I’m in absolute agreement with that. I’ve had personal experience of it — on both sides. He added: “You will have setbacks along the way. You’ll have people telling you that you’re not playing as well as you should do or that you’re not good enough to play at the very highest level, and I’m talking in general. I’ve had various experiences of it and it didn’t do me any harm in the end. “You’re going to get players who might not come through it. If they don’t come through that, they certainly won’t survive in a game. I promise you, they won’t. Email “'The conversation between them was excellent, they've put it right and I'm delighted'”. Feedback on “'The conversation between them was excellent, they've put it right and I'm delighted'”.